One of the common searches for snow blowers is the term “big snow blowers” , so we decided to do a short post on this subject to help consumers decide on when they might need to have a large snow blower. We are defining a large snow blower by the width of the clearing action and not the size of the engine. 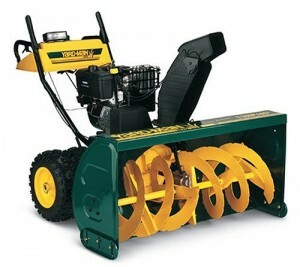 On this site, the largest snow blower we have reviewed so far is the 45 inch wide category. These appear to be the largest snow blowers before you get into the tractor mounted type of blower. These snow blowers can clear a lot of snow in a hurry and are ideal for people with long driveways who clear the snow themselves. Having used one of these snow blowers we can tell you that they cannot be moved manually like some of the smaller machines. Big snow blowers must be started and moved using the hand controls to maneuver it to whatever location you need it to be in. There are multiple reasons, however for most people it comes down to two issues. They have a lot of area to clear and they want to clear this area in a hurry. These are the typical reasons most people have. For example, if you have a long driveway, perhaps a quarter mile long, then you probably want something that can clear the snow quickly. It should cut a wide swath each time they pass up and down the driveway. At 45 inches this is just over 3 feet. Two up and down passes of the driveway will clear most driveways with no problem. If you have a short driveway, there is really no reason to spend the extra money on a big snow blower. At the most you are only going to save a few minutes of time. You have this storage issue that must be dealt with. Large parking lots or areas that need clearing are another major reason for purchasing a large snow blower. Storage can be an issue for some people. These are large machines and will not fit in the standard one car garage with your car in the garage. You will need to allow for storage space or build a storage shed. You could purchase an all season cover to protect your snow blower from the elements. If you have a two car garage and only plan on one car in the garage, a 45 inch big snow blower can easily be stored in it. You cannot store one of these big snow blowers in a two car garage with two cars in it. Here are 4 links to snow blowers we have reviewed so far. These links also include comments left by our readers on what they thought about these machines. As time permits will add more reviews for some of the large snow blowers. We have also discussed the merits of buying a snow blower vs. the merits of hiring someone to clear the snow for you. Both have advantages. It can be sometimes personal preference. Or it can be a question of cost. These are valid reasons that most people take into account when making this decision.